We offer a full garden design service, with an initial free consultation. There we will discuss your needs and budget, listening to your ideas and making some suggestions of our own. Whether you already have a strong idea of what you want or are looking for a little inspiration we can tailor our services to meet your requirements. 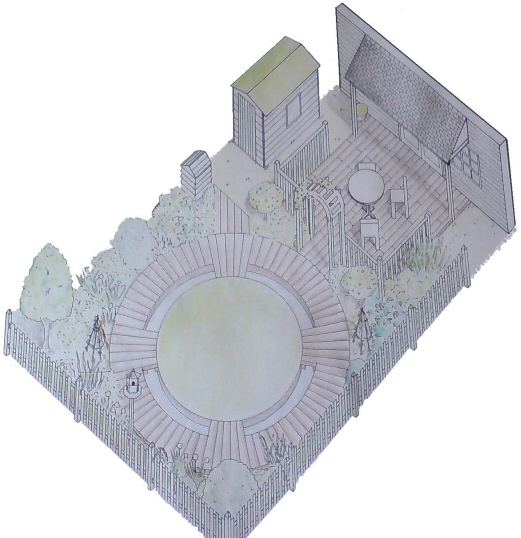 Most clients only need a presentation plan to help visualise the end result for their garden, however to aid in the visualisation process there are some additional drawings we can offer. Below are some examples of those. Click on the garden design pictures to view a larger image. Aspect – knowing which areas get more sun than others is essential for plants and placement of features such as patios. Soil Type – Is the soil acidic or alkaline? Plants can be quite fussy, get this wrong and your dream garden could perish! Uses – A haven of solitude or a place for entertaining? Decide what you want from your new outdoor space. Safety – Are children likely to spend much time outdoors? If so some plants are poisonous, also deep ponds and other features could present problems. Budget – Feel free to dream but try to determine a budget early on, together we can work out what is achievable for your money and what is not. These are just a few of the considerations necessary for a good garden landscape design, there are many more however get the basics right and the result will be an outdoor living space that will not only be yours to enjoy for many years to come but an investment that should more than pay for itself in the value it adds to your home.